I finally got back into sewing this summer. 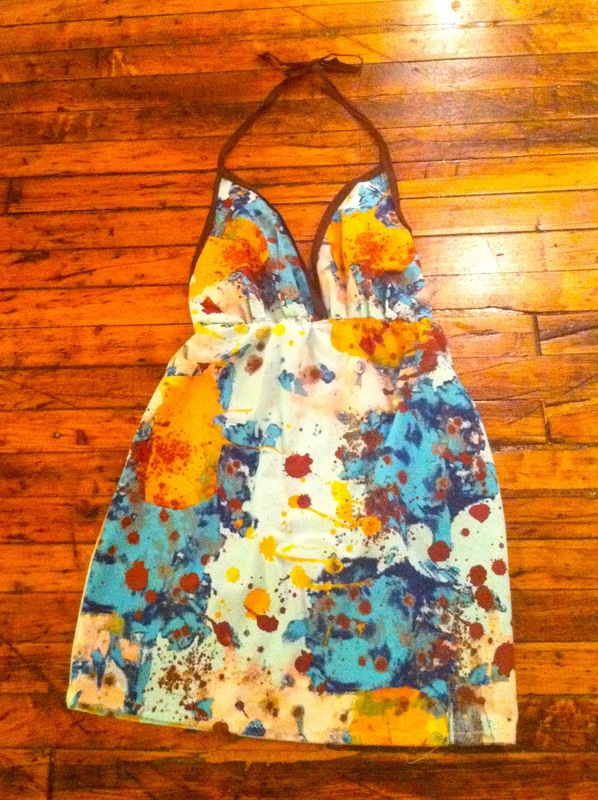 Made this super-simple, chic halter dress from One-Yard Wonders . Yes, it only required one yard of fabric! It's a great beach cover up. This book is chock-full of ideas that will help you use up your stash. I also tried my hand at quilting by making this "Crazy Nine-Patch" quilt for my new great-nephew, Jake. Not bad for my first effort--although I could really benefit from a class. 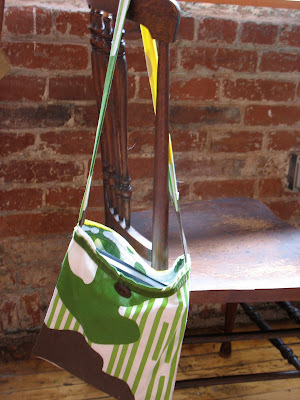 I got the basic instructions and idea from one of my sewing heroes, ELizabeth Hartman of Oh! Fransson. 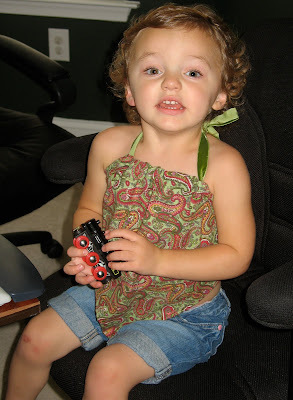 I made this easy-breezy halter top for Ava, my grand-niece, who just turned 2. Timing was perfect since we were in the throes of an inferno-like heat wave here on the right coast. Pattern is from One-Yard Wonders , and only takes about 30 minutes to make. But be advised: the listed sizing is off, so if you make the toddler version, you will need to add ribbon "extenders" to the back of the halter. The book also features the same pattern in an adult version – and if this heat wave continues, I will probably make myself one, too! Are you a sucker for handmade/hand-adorned accessories? 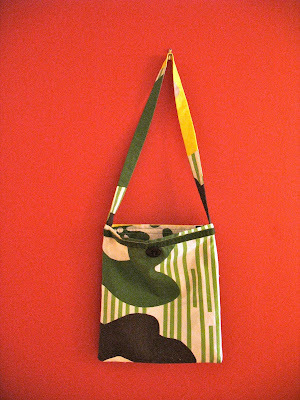 Here's your chance indulge and own a one-of-a-kind tote bag, knowing that the proceeds will be used to help animals in need. Thirty artists, including moi, are creating and/or decorating tote bags to a super project called Art for Pitties. We range from animators and tattoo artists to architects and cookbook authors (!) – and we all share a love for pit bulls. Twenty additional artists are donating one-of-a-kind works ranging from sculptures to handmade jewelry. All work will be auctioned off via the Internet, and 100% of the proceeds will go to SanDiego-based EvenChance: Advocacy, Resources and Rescue. The bags may be displayed at a one-night event in New York City before the auction, so check back on the web site and Facebook fan page for more info. 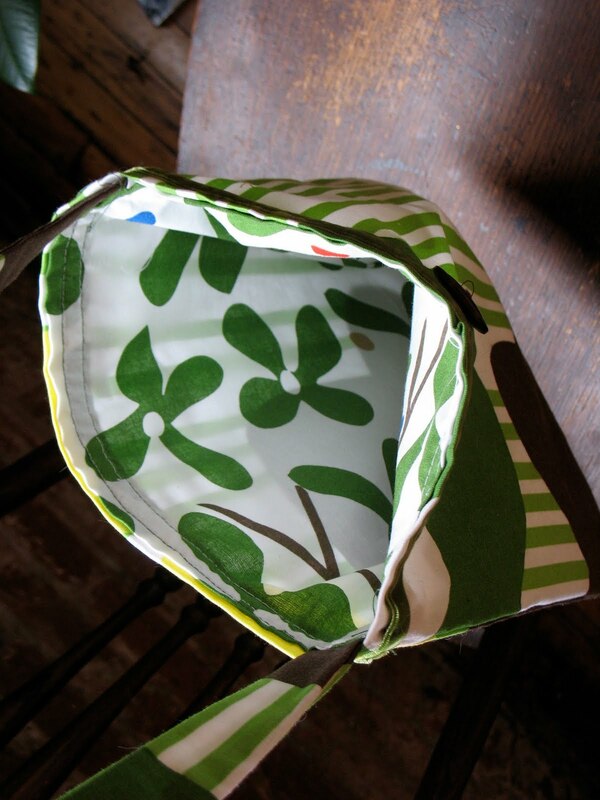 I used some of the cheery Ikea fabric I wrote about in my last post to create my tote. My bag is lined, and features a long shoulder strap and a decorative brown retro button. 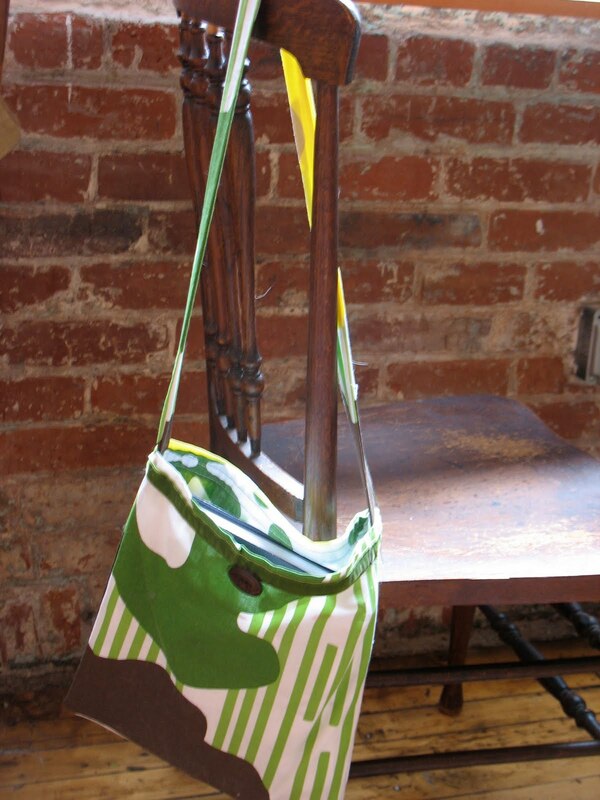 It's perfect for carrying books, craft projects and other small items. I also added a snap closure (not pictured, since I just added it). You can machine-wash it in the gentle cycle. 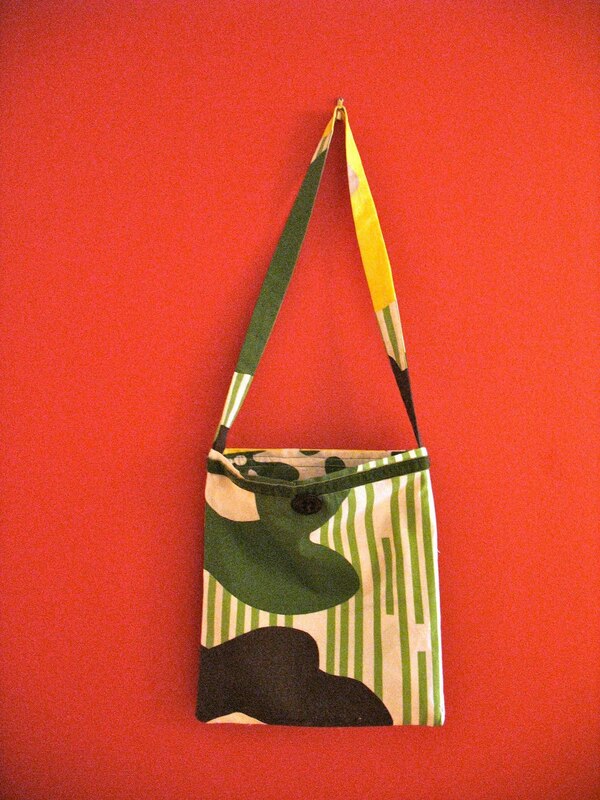 Carrying this bag--or any Art for Pitties bag-- is an instant mood lifter! I love a good bargain, and I love color. I got both last week during an impromptu trip to IKEA, where I snagged these 3 pseudo-Marimekko fabrics for between $2 and $3 a yard. Great, colorful additions to my stash. Not sure what I'll do with them yet, but they're there to inspire me. Welcome to my new sewing blog, which chronicles my adventures as a self-taught, semi-anarchistic urban seamstress, hence the name "Tough Buttons." Lately, I've been whipping out these easy potholders by the dozen. The pattern is in Lotta Jansdotter's Simple Sewing: Patterns and How-To for 24 Fresh and Easy Projects .They're a great way to use up fabric scraps, and they make great gifts. Who doesn't need another potholder? For these potholders, I used various remnants of kaleidoscopic Kaffe Fassett scraps that were burrowing in the bottom of my sewing bag. I was pleased with the mismatched, ragamuffin results. The Urban Vegan is the author of The Urban Vegan, Celebrate Vegan, Pies and Tarts with Heart. She has published recipes in VegNews, Vegetarian Times, Philadelphia Daily News, and Végéteriens, (France's first vegetarian magazine). She's been interviewed in the New York Times and International Herald Tribune, and has done cooking demos everywhere from New York to Paris. She lives in Philadelphia with her 2 cats, and tweets @theurbanvegan.